St John’s is on the corner of Station Road and Sheepcote Road in central Harrow, opposite Debenhams. Please use the main entrance in Station Road. We are a short walk (about 5 minutes) from Harrow on the Hill Station (Metropolitan and National Rail) and the Harrow Bus Station and about 10 minutes from Harrow and Wealdstone Station (Bakerloo, Overground and National Rail). For car parking see below. The rehearsal will begin at 4 pm (the church will be open at least half an hour before then) and will finish at about 5.30 pm. Afterwards, tea and coffee will be available, but unfortunately as the Victoria Hall has been demolished as part of a redevelopment we will be unable to provide sandwiches and cake this year. The performance will begin at 7 pm and lasts just over an hour. We will be performing the work in its entirety. There will be plenty of room for your family and friends in the congregation: there is no admission charge but there is a collection on the way out for the Choir Fund. Many of the women singers wear white blouses and black skirts or trousers, and the men a dark suit and tie with white shirt, but this is entirely optional. Cassocks and surplices are not worn. Because of the redevelopment of the Victoria Hall, there is no car parking on site. The recommended local car park is in Greenhill Way (entrance just around the first corner after you turn into Greenhill Way from Station Road). It costs £1.40 an hour (I am not sure if charges apply on Good Friday). There are also slightly nearer pay-and-display car parks at the north end of Lyon Road (access off Gayton Road), but these are smaller and more likely to be full. There are also on-street car parking spaces in Lyon Road and St John’s Road (access via Lyon Road), but these are more expensive and the maximum stay is 2 hours. All these London Borough of Harrow car parks accept cash and also card payment via telephone or mobile app through RingGo (https://www.myringgo.co.uk/howitworks) for which there is a 20p surcharge. You can also pay by sending them an SMS message if you are already registered with them (this costs an extra 10p for the SMS reply confirming that you have paid: please wait in the car park until you have received this). STOP PRESS: Parking arrangements are changing from 1 April. The parking provider will be paybyphone (details: https://www.paybyphone.co.uk/how-it-works/parking). Prices may change too. Please bring your own music if you have it, but otherwise we have plenty of copies for you to borrow. 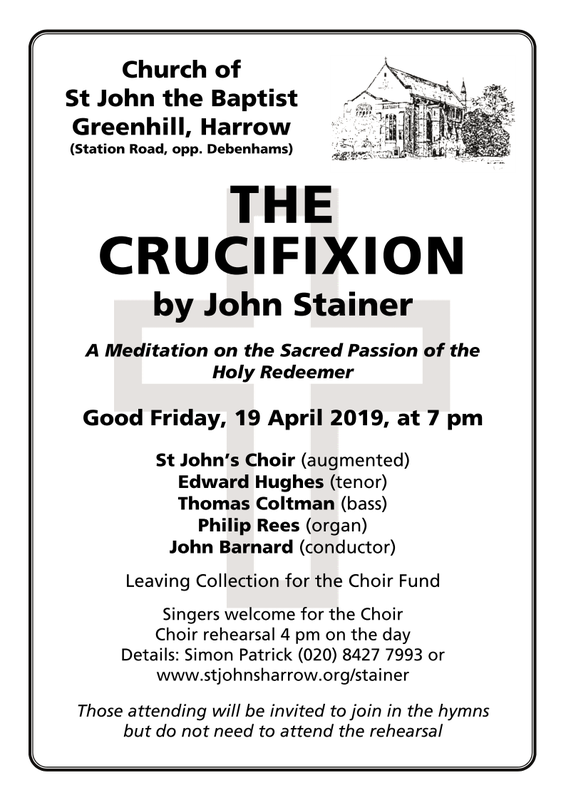 There’s no need to tell us you’re coming, but if you’d like to, or to ask any questions, please contact Simon Patrick, acting organist of St John’s, on 020 8427 7993 or email him at simon.patrick@cantab.net.